TurboDrop ® Asymmetrical DualFan adds a new dimension to high performance spraying. Multiple spray trajectories aim toward the target providing a unique combination of coverage, penetration and drift control. 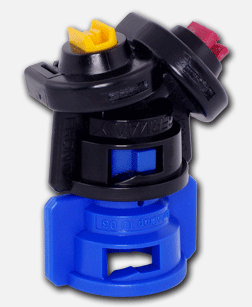 Lower maintenance is another benefit: it has a difficult to plug and easy to clean Venturi air injection design. The TurboDrop® TADF has become the nozzle of choice for coverage critical applications with contact herbicides, insecticides and fungicides. Shop Barndoor Ag today for all of your Greeleaf sprayer nozzles. 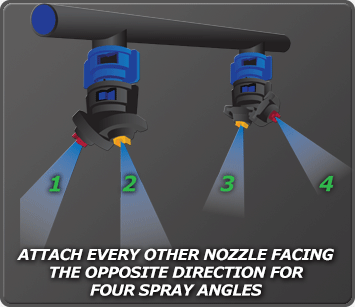 Using the Multi-Purpose DualFan NozzleThe TurboDrop® Asymmetric DualFan (TADF) is a revolutionary technology in spray nozzle development from Greenleaf Technologies. 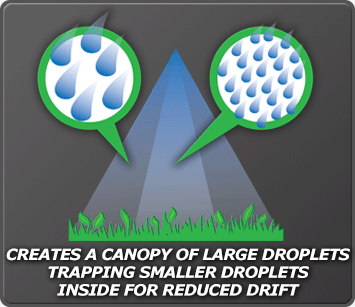 With this dual fan design you can achieve a low drift canopy where larger droplets surround smaller ones in a four-way spray pattern that balances coverage and drift control.